From January 1st to Mai 3rd you can see and touch 2 Openmoko Freerunners in the DHM (Deutsches Historisches Museum in Berlin! They serve as faked cellphones to control a sms-chatwall in the exhibition "Die Sprache Deutsch". 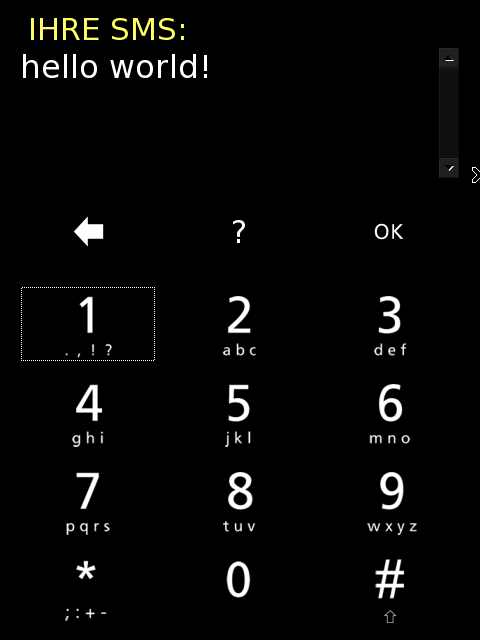 Debian is running in the Flash and a tiny Python-GTK-Application, which simulates a simple cellphone-GUI, which sends fake-sms to a MySQL-server. 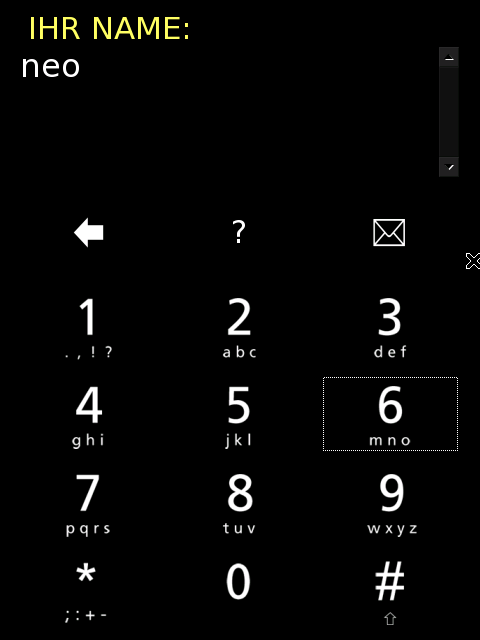 Another PC accesses the server and produces the output for the sms-chatwall. Quite simple, but chic! As Soon as everything is ready we will make it accessible to you, if possible. Ab dem 14. Januar bis zum 03. Mai werden im Deutschen Historischen Museum in Berlin 2 Freerunner zu sehen und anzufassen sein! 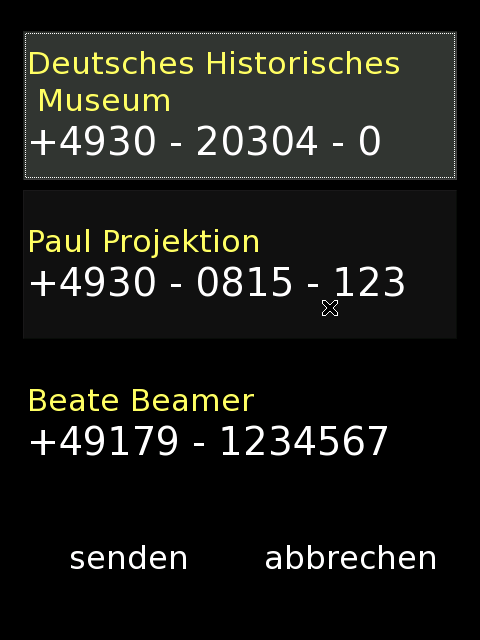 Sie dienen als "Bedienung" einer SMS-Chatwall in der Ausstellung "Die Sprache Deutsch". Auf ihnen läuft ein Debian (im Flash) und eine kleine Python-GTK-Anwendung, die eine simple Handy-Oberfläche simuliert, über die "SMS'" an einen MySQL-Server geschickt werden. Ein anderer PC greift auf die Daten zu und gibt die SMS-Chatwall an den Beamer aus. Alles ganz simpel, aber chic! Sobald alles fertig ist, werden wir es, wenn möglich, zugänglich machen! The exhibition opened just this evening. The Freerunners are fixed, ready and usable. And during the Vernissage some people really used it! Really!!! The last little changes in the GUI are on their way and the code and the configurations are just about to be made up for publication. :) There are just some tiny problems left about the network-connection to their attached PC, but never mind!